MOLINE, IL - Veteran wide receiver Ryan Balentine caught five passes for 85 yards and a trio of touchdowns as the Iowa Barnstormers held off the Quad City Steamwheelers tonight. The defending champions move to 1-0 with the win. The Steamwheelers, who moved to the Indoor Football League from Champions Indoor Football over the off season.drop to 1-1. Iowa had a bye in week 1. The Barnstormers struck twice in the opening quarter with a pair of touchdown passes from Daquan Neal to Balentine of seven and six yards, respectively. Iowa led 13-0 at the end of the first. Quad City got on the board just under three minutes into the second quarter on Isiah Neely's three-yard touchdown screen pass around the left side. The Barnstormers countered on Neal's three-yard pass to Connor Hollenbeck. Neal struck again, hitting Samuel Charles for 27 yards. The Steamwheelers pulled to within 26-14 with four seconds left in the half on Hilliard's three-yard run. That would turn out to be the halftime score. The Steamwheelers pulled to within five with 11:33 left in the third quarter on Quinton Pedroza's 26-yard pass from Hilliard. The Barnstormers scored on a two-yard run from Jamal Tyler three minutes later, and extended their lead on Neal's two-yard run with 9:23 remaining in the quarter. 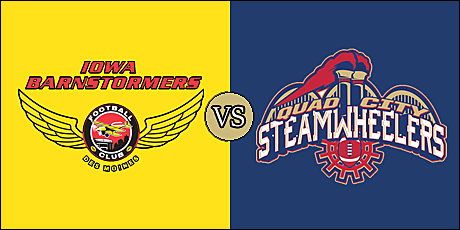 Quad City scored on a 36-yard bomb from Hilliard to Keyvan Rudd to make the score 40-27 in favor of the Barnstormers Kewan Alfred's fumble recovery in the end zone just prior to the end of the third quarter made the score 40-33. Neal's 31-yard pass to Balentine lifted the Barnstormers to a 46-33 lead before Hilliard hit Rudd for 33 yards to trim the Quad City deficit to 46-39 with 4:33 left. On the ensuing kickoff, Tyrell Pearson returned the kickoff 51 yards to put Iowa up 53-39 with just over three-and-a-half minutes left in the game. Quad City held the edge in total offense, 255 yards to 154, but only managed 18 yards rushing. The Steamwheelers were flagged 13 times for 129 yards, and the Barnstormers were penalized eight times for 45 yards. Daquan Neal was spectacular in his first career start, completing 10 of 11 passes for 154 yards and five touchdowns. He also rushed 11 times for 41 yards and another score. Balentine finished with five receptions for 85 yards and three touchdowns, and Connor Hollenbeck had four grabs for 46 yards and a score. Jourdan Wickliffe led the Barnstormers' defense with six total tackles. Jeremly Gloston recovered a fumble and Jaquan Harley recorded a sack. Hilliard's numbers were solid as he went 18 of 29 for 255 yards and four touchdowns. He also rushed for a touchdown. Carlos Wiggins gained 44 yards off six carries. Rudd had six catches for 132 yards and two scores. Pedrosa and Neely each caught a touchdown pass. Dannzel McDaniel tallied 8.5 total tackles, and Perez Ford had a sack. The Barnstormers will host the Green Bay Blizzard on March 9 in their home opener. Kickoff is set for 5:05 p.m. The Steamwheelers have a bye in week 3, but are back in action as they make the short trip to Cedar Rapids to battle the River Kings on March 15 with a kickoff slated for 5:05 p.m. All times are pacific standard time. Both games, as well as all IFL games this season, will be streamed live on the IFL's Official YouTube Channel. SCtoC will present previews of those, and all, games this season. Those previews will be posted on the board of the home team in each game.